Volumes 3 & 4 were developed and edited by T M (Mike) Porter of Porter GeoConsultancy Pty Ltd (PGC). Papers were received by late 2010, and after review and editing, both volumes were officially launched by PGC Publishing on July 1, 2011. T.M. (Mike) Porter, Porter GeoConsultancy Pty Ltd, Adelaide, South Australia. Part 1 - An Overview -and- Part 2 - A Review. Patrick Williams, Economic Geology Research Unit,School of Earth and Environmental Sciences, James Cook University, Townsville, Australia and Clump Mountain Geoscience Pty Ltd, Mission Beach, Australia, Mark Kendrick School of Earth Sciences, University of Melbourne, Australia and Roberto Xavier Departamento de Geologia e Recursos Naturais, Instituto de Geociências, Universidade Estadual de Campinas, Campinas, SP, Brazil . Sources of Ore Fluid Components in IOCG Deposits. Nicholas Hayward, Teck Australia Pty Ltd., Perth, Western Australia and Roger Skirrow, Minerals Division, Geoscience Australia, Canberra, ACT., Australia. Geodynamic Setting and Controls on Iron Oxide Cu-Au (±U) Ore in the Gawler Craton, South Australia. Colin Conor, Geological Survey Branch, Primary Industries and Resources South Australia, Adelaide, South Australia Oliver Raymond, Minerals Division, Geoscience Australia, Canberra, ACT., Australia, Tim Baker, Geological Survey Branch, Primary Industries and Resources South Australia, Adelaide, South Australia, Graham Teale, Teale and Associates, Pty Ltd, Prospect, South Australia, Patrick Say, Rex Minerals Ltd., Ballarat West, Victoria, Australia, and Geoff Lowe, White Rock Minerals Ltd, Ballarat, Victoria, Australia. Hamish Freeman, OZ Minerals Ltd., Adelaide, South Australia and Marcus Tomkinson, Epigenesis Consulting Pty Ltd, Perth, Western Australia. Geological Setting of Iron Oxide Related Mineralisation in the Southern Mount Woods Domain, South Australia. T. M. (Mike) Porter, Porter GeoConsultancy Pty Ltd., Adelaide, South Australia. 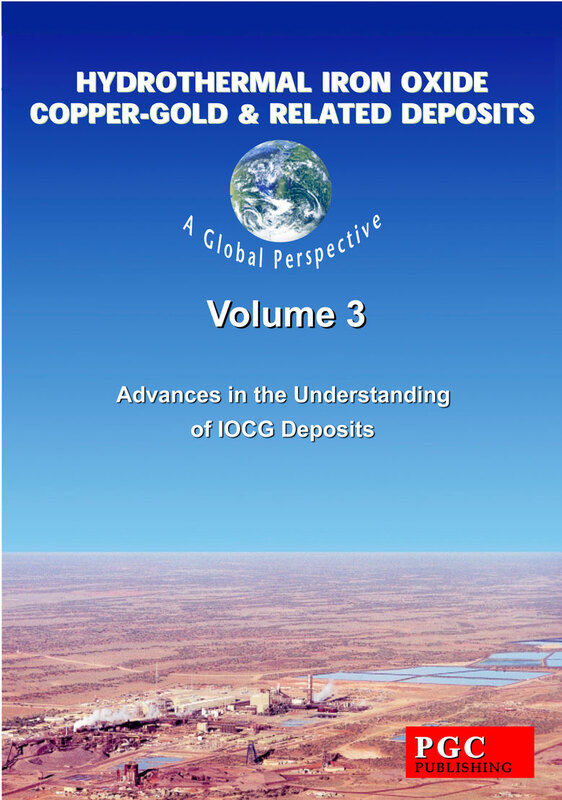 The Carrapateena Iron Oxide Copper Gold Deposit, Gawler Craton, South Australia: a Review. Physical and Chemical Characteristics of the Ernest Henry Iron Oxide Copper Gold Deposit, Cloncurry, Queensland, Australia; Implications for IOCG Genesis. The Mount Elliott IOCG System, Eastern Fold Belt, Mount Isa Inlier, Northwest Queensland. John McLellan, Thomas Blenkinsop, Nicholas Oliver, James Cook University, Townsville, Qld, Australia, Roger Mustard, Auzex Resources Ltd., Townsville, Qld., Australia and Cathy McKeagney, BHP Billiton Petroleum, Perth, WA., Australia. Mesozoic IOCG Mineralisation in the Central Andes - an Updated Review. Ana A. Rieger and Robert Marschik, Economic Geology Research Group, Department of Earth and Enviromental Sciences, Ludwig-Maximilians Universitat, Munchen, Germany and Manuel Diaz, AngloAmerican Chile, El Soldado Division, Santiago de Chile. The Mantoverde District, Northern Chile: An Example of Distal Portions of Zoned IOCG Systems. Roberto Perez Xavier, Lena Virgínia Soares Monteiro, Carlos Roberto de Souza Filho, Ignacio Torresi, Emerson de Resende Carvalho, André Luiz Silva Pestilho, Carolina Penteado N. Moreto, Instituto de Geociências, Universidade Estadual de Campinas (UNICAMP), Campinas, SP, Brazil and Ana Maria Dreher, CPRM, Serviço Geológico do Brasil, Rio de Janeiro, RJ, Brazil. The Iron Oxide Copper-Gold Deposits of the Carajás Mineral Province, Brazil: An Updated and Critical Review. This volume and its contents was developed, organised and edited by T M (Mike) Porter of Porter GeoConsultancy Pty Ltd (PGC) and was published and is on sale globally via the world wide web through the PGC Publishing electronic bookshop. Papers were peer reviewed by the editor and other appropriate experts.